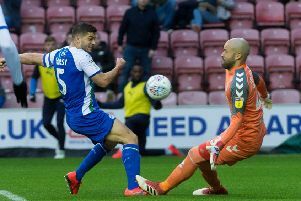 Wigan Athletic ace looking for Perks! Wigan Athletic midfielder David Perkins admits this week could prove to be a pivotal week in the destination of the League One title race. After getting back to winning ways in the league at the weekend against Rochdale, Latics are at Bristol Rovers on Tuesday night knowing a win could see them return to the top of the table. With leaders Blackburn – who are three points clear, having played three games more – next up on Sunday in a televised showdown at Ewood Park, Perkins knows a couple more big wins could prove decision in the final shake-up. “They’re all big games, but we’ll look to Bristol to hopefully pick up another three points to take into the Blackburn game this weekend,” acknowledged Perkins. Having led from the front for most of the season, Latics have slipped into the uncustomary position of second and now third behind Shrewsbury due to their FA Cup heroics. “I’m not a person who’s constantly looking at the league table, but it is nice to see yourself up there,” Perkins added.